This "wintertide" has been ridiculously warm here in the northeast so far. Granted, it's still not technically winter until next week. But this past weekend, I walked barefoot in my backyard wearing nothing but jeans and a t-shirt. It was in the 70's. All things considered, I'd prefer our normal December temperatures with highs in the low 40's, especially approaching Christmas time, but hey, if it feels like Florida in New Jersey in mid-December, I'll roll with it...at least for a little bit. Not so much with Sonia. She moved nearly 3,000 miles to get away from the year-round "feels like you're inside even when you're outside" vibe of Southern California, and by golly, she wants it to feel like winter. I must admit these high temps don't really put me in the mood to have hot coffee or hot tea, but I could probably count on one hand the number of times I've properly paired a tea cookie with actual tea in my whole life. Tea cookies and milk, yes. Eggnog, probably. Sugarless energy drinks, maybe, sadly. And by "maybe," I mean yes. 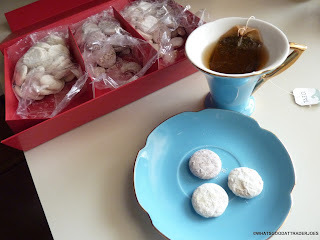 So right now, just for you guys, our faithful readers, I'm going to go heat up some hot tea and have it with these tea cookies so I can tell you how it works. I'll turn on the air conditioning if I have to. Brb. Okay, I have returned with a cup of steaming hot black tea. And yes, as shocking as it may sound, it pairs very well with these cookies. It really enhances their flavors somehow. My favorite, with or without tea, is the hot cocoa flavor. I think it tastes like a solidified version of actual hot cocoa. Sonia thinks it's just vaguely chocolatey. The Italian wedding flavor is the closest to just a sweet, run-of-the-mill, not-going-for-any-particular-flavor type cookie out of the three. It's a close second favorite for me. The gingerbread flavor is pretty heavy on the ginger. It leaves a nice little tingle on the back of your throat after consumption. 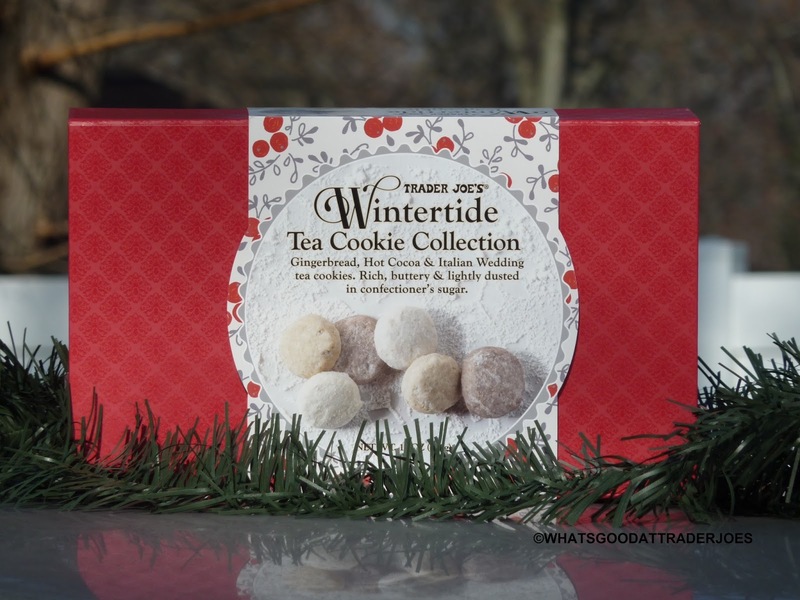 Sonia thinks it's similar to Trader Joe's Pfeffernüsse, but she says she likes these tea cookies even more. They're her favorite of the three flavors. I guess they're vaguely reminiscent of the German spice cookies, but I feel like the pfeffernüsse had a more complex flavor and were slightly softer. I wonder if these gingerbread tea cookies would pair well with red wine as well...? The box is $7, but as Sonia pointed out, if Starbucks, for example, were to offer any similar product, it would probably run you in the ballpark of $20. The packaging is attractive, elegant, and top quality. The box is worth hanging on to for future use. 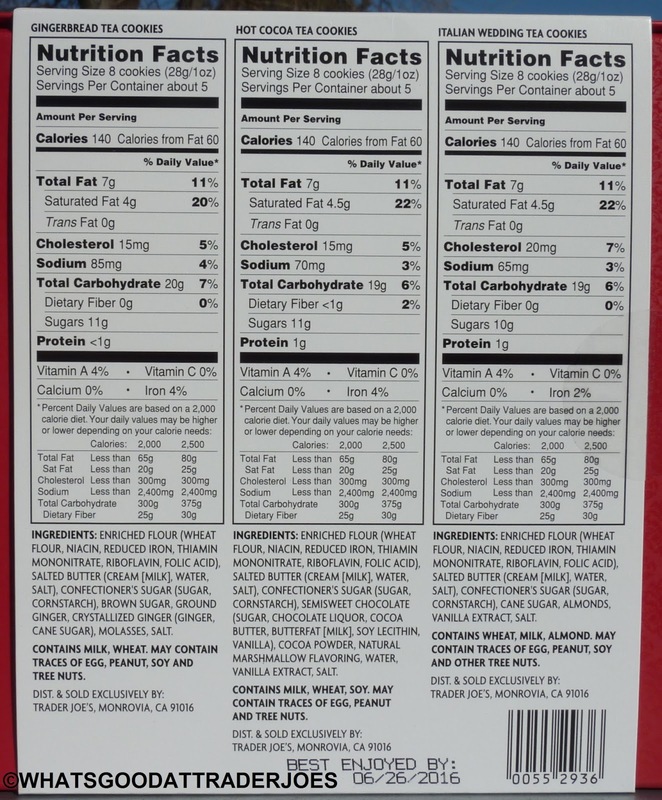 Each cookie flavor is packaged in its own bag and there are three separate compartments within the box. There's even a magnetic flap on the front of the box so it stays closed and keeps its shape without having to tuck ugly cardboard tabs into little slots on the side of the container. This product is very much about presentation and would probably be a great thing to take to a posh Christmas party or to give as a gift. 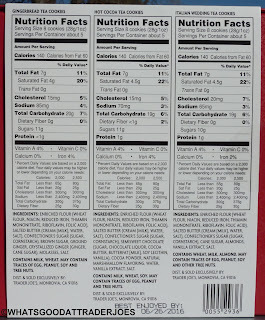 I'm not very big on any dry, powdery cookies in general, and these particular flavors are good, but they don't really have that wow factor in my opinion. I would never buy these just for myself to snack on, but as something to bring to a holiday gathering, they're just about perfect, so I can't go lower than three stars. Sonia gives it four stars, freely admitting that the beautiful packaging heavily influenced her score. I like the idea of individual bags in the pack. No mess at the start. 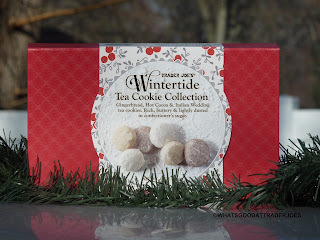 Can take out the cookies and put on a platter then put a nice mix of tea bags in the box remove the labeling. The box is a great gift box. Absolutely. If I were scoring this product on the packaging alone, it would get 5 stars!